WARNING: Beware of Uncorked Tushes! As you can probably deduce -- I like ducks. I have been teased that my interest in them is more of an unhealthy obsession. If given the chance, my husband would certainly give you an exasperated diatribe on the décor of our guest bathroom (hey, I've gotten better, they are not in our master bathroom anymore!). And don't even get him started on the gradual invasion of the rest of the house! My poor mother is stuck with somewhere around six hundred stuffed, carved, rubber, candle, glass ducks that I haven't yet been able to smuggle past him. I swear I'm not crazy though. You see, when I was three years old, my parents bought me six hatchling ducks for Easter. I raised them and the next year I received six more. It became my Easter tradition right up until I was eighteen years old. 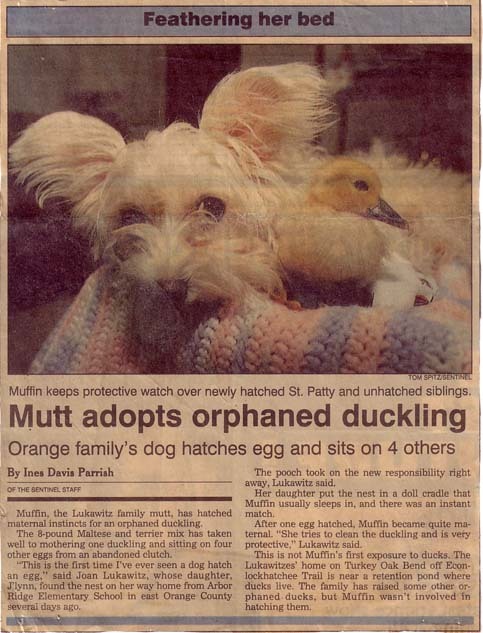 Heck, even the family dog helped out by hatching her own duckling one St. Patrick's day. And ducks really are marvelous pets. They are very loving (or dependent, however you want to look at it), they are funny, and they are great attention grabbers. Have you ever seen the looks that people give to a person walking around the neighborhood with a line of ducks waddling behind? 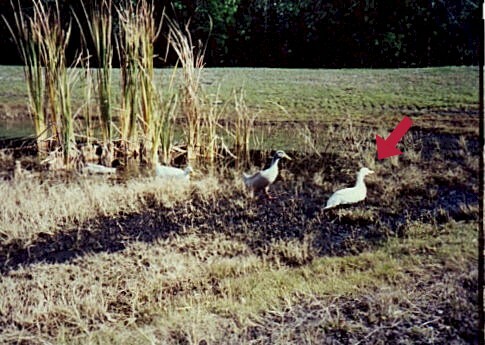 Although all of my ducks were very special to me, I must admit that there are those that really stand out. 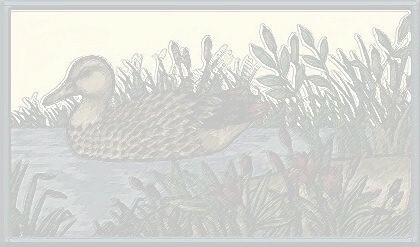 Unfortunately, I don't have any clear pictures of the most beautiful ducks I have ever laid eyes on. Coal and Ember were Swedish Blues. They were black all over, but in the sun, there were iridescent streaks of blue, green, purple, and red. Unfortunately, they were also epileptic. Don't laugh! It's true, poor Ember drowned in her pool during a seizure and Coal later died from repeated head trauma when he got very sick and was having several seizures in his cage. It was very sad. In case you ever need to care for an epileptic duck, you should know that it comes from some sort of protein deficiency. Coal and Ember were spoon fed a food processed mixture of grain, egg shells, and peas. It helped them a lot, but unfortunately, they were too sick when we figured it out. This is Rosencrantz, a white Peking. I received her as a gift from my manager on my eighteenth birthday -- a month and a half after moving into an apartment with a NO-PETS lease. It was not easy convincing my landlord to let me keep a duck in my apartment - but I am convincing so I was able to keep her, with the neighbors' consent - until she was old enough to take to the pond behind my mother's house. And that is how my cousin and I came to be the chicks in the duck's apartment. 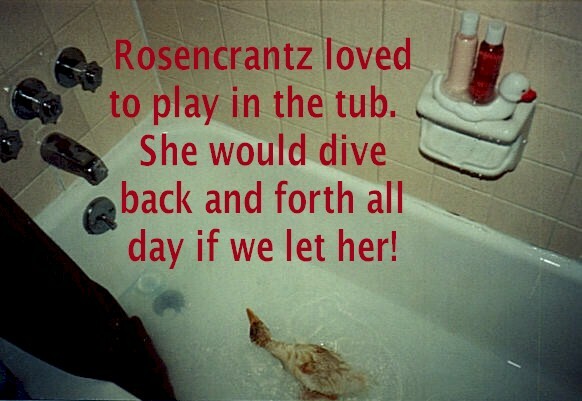 Rosencrantz was a happy duck too. She lived in the kitchen (where she could be easily cleaned up after) and got her morning showers with my cousin and evening showers with me. 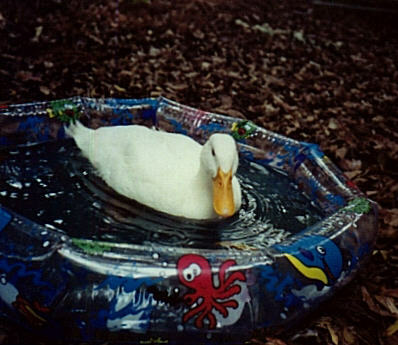 Our backyard was a cemetery and beyond that there was a lake, so on our free afternoons, we would walk her across the cemetery to swim in the lake with the other ducks and she would follow us home. This was particularly amusing when a funeral was in progress one day on our way home and one of the mourners shouted that there was a duck following us. This was the day I had to release her into my mom's backyard. She made friends quickly but she was hesitant about leaving me. You see, she's looking back at me with a tear in her eye. See it? !